Colorado Springs, Colorado. 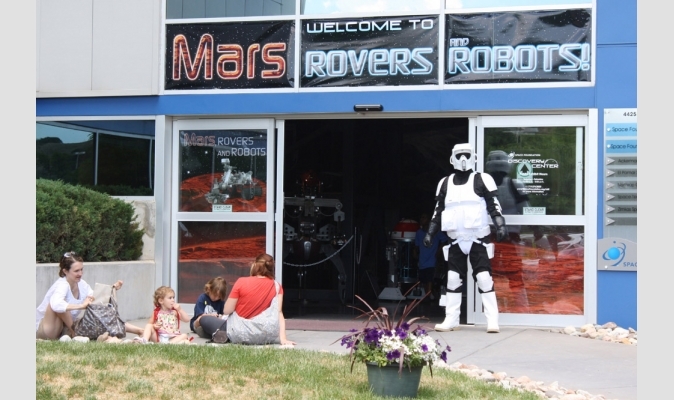 June 4, 2014 – This summer, the Space Foundation Discovery Center in Colorado Springs is bringing space, science and technology down to Earth for people of all ages to enjoy. Beginning June 10, Summer of Discovery 2014 launches with a full 10 weeks of space-related educational activities. Each two-week theme will culminate in an action-packed Saturday of special activities. The Space Foundation Discovery Center is the region’s only space, science and technology attraction, and is located at 4425 Arrowswest Drive in Colorado Springs, just off of Garden of the Gods Road. The Discovery Center is open Tuesday through Saturday, 10:00 a.m. – 5:00 p.m., and until 8:00 p.m. one Thursday evening monthly. Group rates are available and reserving in advance is recommended. For more information, including holiday and other closures, call 719.576.8000 or visit www.spacefoundation.org/museum. Wells Fargo is the Saturday Sponsor for Oceans on June 14 and 21. Other sponsors for Summer of Discovery 2014 include: Ent Federal Credit Union, Astronomy theme sponsor; BKD, July 19 Saturday sponsor for Mars, Rovers and Robots; Allegra, printing co-sponsor; ATK, printing co-sponsor; MIDO Printing Company, Inc., printing co-sponsor; OneTouchPoint, printing co-sponsor; SpaceUnited, activity co-sponsor; and Wendy’s, activity co-sponsor. Sponsorship opportunities for Summer of Discovery 2014 are still available for businesses, organizations and individuals.